Crescenta Raingutters prides itself on crafting gutters that are both attractive and long-lasting. We believe that investing in your home or office should make your neighbors and clients take notice. 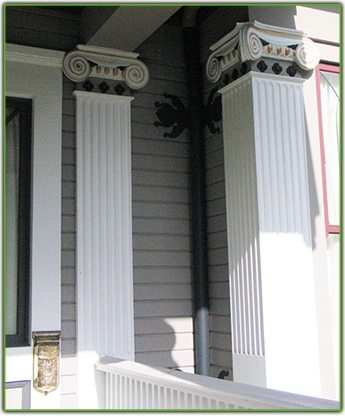 If you're having problems with your current downspouts, ask us to assess the condition. We can inspect your pipes, provide gutter cleaning services, and install debris screens upon request. We have equipment that allows us to fabricate gutters on site. Whether you want seamless aluminum or seamless copper gutters we can make them at your property. We can assess if your gutters can be repaired. We'll check the supports, seams, and make sure there is proper flow. If we discover any issues, we consult with you about the most feasible options. Many gutter problems are due to minor blockages. Our staff will clean your gutters to ensure proper water flow. Many clients schedule seasonal appointments to make certain their gutters remain in top shape. Request to be added to our email notification program. In addition to fabricating custom gutters by hand for historic buildings, we can also supply special metal configurations for modern style architecture. From small decorative touches to personalized designs, ask us about the other ways we can personalize your system.